Vazante’s English title is “The Surge,” yet the direct translation of the word from Portuguese is “ebb,” a gradual fading away, which conjures quite a different feeling. This contradiction is actually quite fitting, for director Daniela Thomas delicately teases both sensations throughout the duration of the film, maintaining an underlying tension between an oppressive yet decaying past and the tenuous fecundity of its family’s future. Avoiding the sweeping grandiosity and visual tidiness of so many period pieces, Thomas brings a deeply tactile approach to her first solo feature, which is set in the mountains of 19th-century Brazil. The film opens with a white woman giving birth, a black slave telling her to push, lacy curtains flapping in the breeze. In parallel montage to this birthing scene, belabored footsteps traverse a water-worn path; the bare feet and legs of humans and cattle walking in unison, almost indiscernible, over the muddy terrain. The Portuguese drover, Antonio (Adriano Carvalho), returns to his isolated mountain estate, with his caravan of cattle and new slaves from Africa, to discover that his wife and baby died in childbirth. The wife’s brother and family, including their spirited teenage daughter, Beatriz (Luana Nastas), live in a house on the property, which originally belonged to the wife's father, a diamond miner. It does not take long to foresee the trajectory of what will unfold. Thomas (who co-wrote the script with Beto Amaral) conceived the film based on a fragment of a family story about a distant relative: a slave trader who, crucially, never wore shoes and married a young girl, but waited until she got her first period to consummate the marriage. While her husband is away, Beatriz roams the property almost as an apparition from a world gone by, distant, stationary, watchful; she observes the activities around her but is disconnected from them. Still a child herself, she moves erratically, at one moment staring listlessly from the balcony, the next running through fields, laying in a meadow, and caressing the overgrown foliage surrounding her. She strikes up a friendship with a young slave boy on the property who is close to her age. As the action slowly builds to an inevitable, devastating conclusion, it becomes clear that Vazante reckons with history in a sophisticated way. For her cast, Thomas brings together a variety of people to create a melting pot of human experience, in a sense recalling the origins of the Brazilian history she endeavors to examine. The slaves on the desolate estate are played by inhabitants of a remote Brazilian village founded by runaway slaves, while the new slaves Antonio brings in at the beginning of the film are played by West African refugees, recently arrived in Brazil. The African characters are portrayed as stereotypical examples of tortured strength: glistening muscles bound in chains. This is most specifically illustrated by Toumani Kouyaté as a newly arrived slave who speaks with vehement passion even though no one can understand him. Vazante is not their story, but they are swept up in the tide. Antonio, played by Portuguese theater actor Carvalho, has the tormented look of portraits of European nobility from the Middle Ages. He is rigid and ill at ease in the world—the quintessential colonist, trying to assert mastery over an environment he does not fully understand; his perpetually bare feet the only anchor to the earth he is trying to make his home. Beatriz, at moments just as stiff and misplaced as Antonio, acts as more of a gateway between the crumbling world of the colonialists and the new Brazil that is forming underfoot; her ancestry is from Portugal, like her husband’s, but she is part of a younger generation, raised in this wild environment that she is both a part of and apart from. Each actor is cast precisely to type: a perfect function of her or his historical role, as written by the conquerors. The greatest joys of the film can be found in the textures and meticulous attention to detail, both visual and aural. 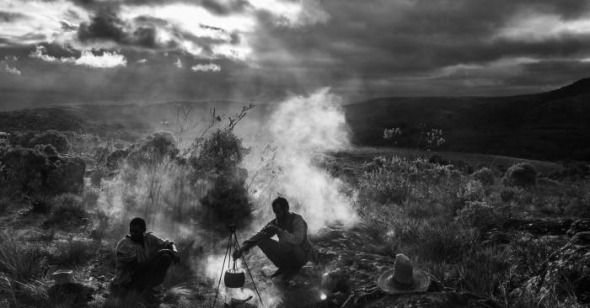 Cinematographer Inti Briones shot the entire film in black-and-white cinemascope, using only natural lighting and candle or fire light, and the textures are rich and have a hand-hewn quality, and the framing of the natural landscape overpowers everything. The sound design complements this: there is a profound peacefulness and quiet to the film. Sound designer Vasco Pimentel recorded layers of audio from birds, animals, and nature at all times of day to create a total ecosystem that places the surrounding wilderness as the center of equilibrium. Any human sounds—far off or close up—stand out and demand full attention, often ominous forbearance of what's to come. The rich environment created by the soundscape heightens the physical remoteness of the lonely estate. The isolation is geographic, but also represents a historical shift. Vazante focuses on the people who came to the country and the wild landscape that surrounds them rather than the indigenous population: it portrays a moment when the interlopers began to integrate with their surroundings and each other, thus forming one aspect of the Brazil of today. There is a sense here that, even as early as 1821, the old order, if not fully established, is already fading away, and that the diamond mining that brought the Portuguese to the region has run its course. “There are no more diamonds,” though they live in the Diamantina Mountains. Jeremiah, Antonio’s right-hand man on the estate, encourages him to start farming. The slaves are used to working in mines—they don’t know how to tend the land, yet they begin to slowly master it. No one belongs there—neither Antonio and his fellow Portuguese nor the slaves brought there against their will. The premise that precipitated their presence in this foreign land is beginning to crumble, making room for a new order—something rising and something fading away.